One spring project you might want to put on your list is an herb garden for your chickens. I have a small section for herbs in my vegetable garden, the chickens even have their own herb garden right next to their coop - you don't need a lot of room for them - and herbs are exceedingly nutritious for chickens. Over the years I have observed that chickens love to eat fresh parsley, basil, cilantro, mint, oregano and other herbs. 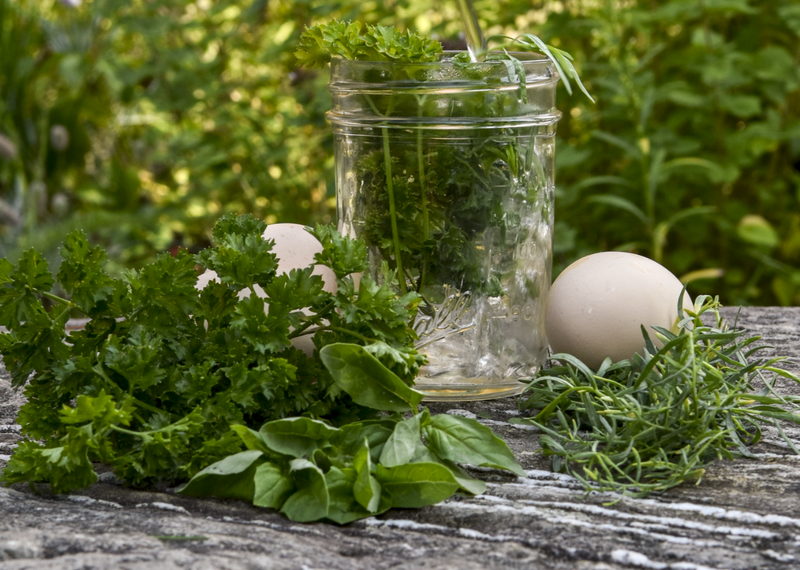 Herbs contain lots of nutrients and since chickens can actually choose to direct nutrients towards themselves or to their eggs, the more nutrients they eat, the more excess they have to direct right into their eggs. In fact, oregano has been scientifically studied and proven to be a natural antibiotic, able to combat coccidiosis, salmonella, infectious bronchitis, avian flue, blackhead and e-coli. Thyme is being added to chicken feed by commercial poultry farms to improve flock health. In fact, nearly any culinary herb is perfectly safe for chickens. 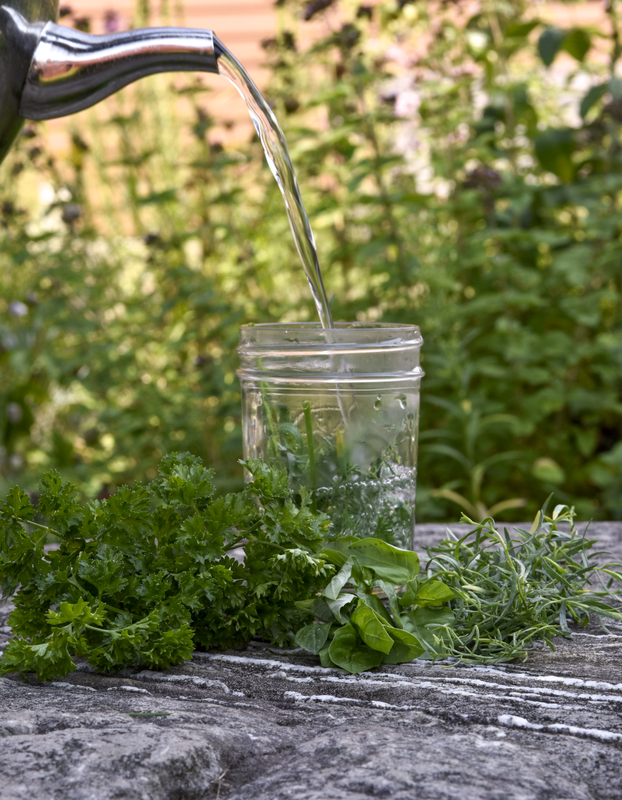 I offer my chicken fresh and dried herbs year round and and they can nibble on the herbs in their herb garden when they free range, but another thing I like to do is to brew herbal tea for my chickens. They really seem to enjoy the warm tea on cold winter days (I add ice cubes and give them "iced" tea in the summer) and it gives them a welcome - and nutritious - change from plain water. Herbal tea is also beneficial if you have a sick or injured chicken. They will often stop eating when they're not feeling well, but generally will keep drinking, so you can get some nutrients and vitamins into them through the herbal tea. You can use herbs like basil, dill, oregano, parsley, sage or thyme in your tea for them, as well as teas brewed with a blend of several herbs. The tea is also great to serve to baby chicks. It helps build healthy immune systems and has a wide array of health benefits for growing bodies. I think it also gets them accustomed to the flavor of the various herbs so they are more apt to eat them as adults. 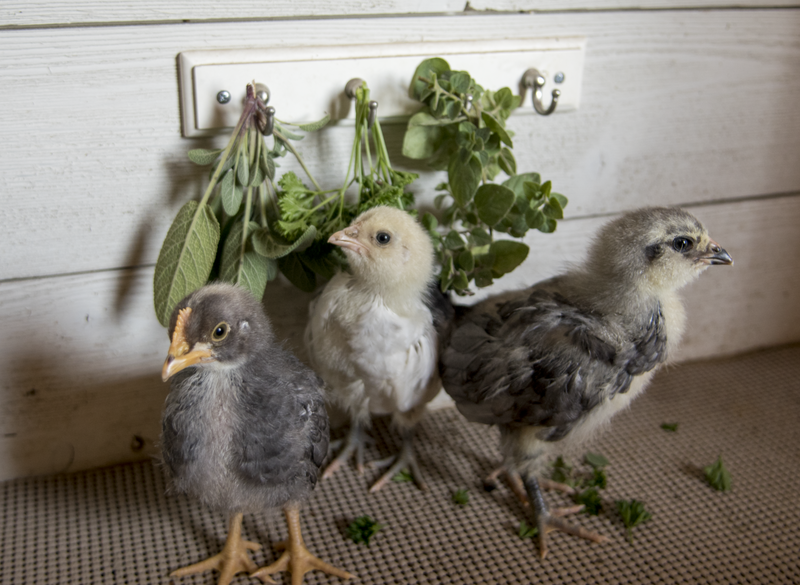 Herbs such as oregano, sage, parsley and thyme are especially nutritious for chicks. 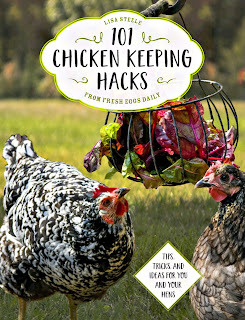 To make tea for your chickens, just fill your teakettle with water and heat to boiling. Partially fill a glass mason jar with fresh herbs of your choice. Pour the boiling water over the herbs to completely cover then, then let them steep for ten or twenty minutes or so. I usually leave it until the liquid has completely cooled. If you wish, you can stir in a dash of honey for some great antibacterial health benefits. You can strain out the solids or just leave the herbs in. The ducks especially love fishing them out and gobbling them up. Note: I don't like to leave the herbs in the tea for small chicks or ducklings because they could choke on them, so I strain the tea for the little ones. These herb teas are considered 'green treats' and can be fed unlimited to your flock, although when you offer tea, it's always a good idea to also leave your chickens plain water as well, just in case some aren't fond of the tea. So brew some herb tea for your girls - and brew a cup for yourself while you're at it and enjoy tea time together. Facebook | Twitter | Instagram | YouTube| Newsletter ©2012 by Fresh Eggs Daily, Inc. All rights reserved. Lovely post. I might just make some of this for myself today. Thanks ! Just be sure and share some with the girls ! If you build a chicken wire box to protect the plants, you can put them right in the chicken run. The chickens will eat as much as they can reach, without wrecking the plant or pulling it out. We made 4x8' 2x4 frames, laid down, to give them lots of grass/grain shoots to munch on. Looking forward to reading more posts! Hi there ! I certainly will. Thanks so much! It's autumn here in Australia & starting to get cooler, think I'll put a brew on to warm my girls up. I currently have an abundant supply of mint. A lovely post as always. Greta idea-the girls already raid the herb pots. In the winter I give them warm oatmeal. So now it will be iced tea in the summer and warm in the winter. I already change out the water a couple of times a day, to keep it cool. That's a terrific idea to use the herbs. I planted clover and lots of herbs in the area I let them free range. Now I'll brew them some tea with those herbs. and herbs.Chai is simply the Hindi word for tea and can be prepared black, with milk, without sugar, etc. small cafe called "Good Chai" and stock it with the best chai in the world and some mighty delicious snacks. Im going to do this today bc i think its going to be in the 80s. I have been making frozen berries and herb treats for them to keep cool. I have a ton of mint and lemon balm, i think it will do the trick!